I took a few months off from participating in the Foodie Pen Pal exchange due to life being too darn busy, so I was very excited to get back to it this month. Part of what I love about this exchange is getting to “meet” different people and be introduced to different blogs. Since the common denominator in the exchange is food, there’s room for so much diversity! My goodies this month came from Jenny at Vintage Sugarcube. Her blog is so fun and interesting and so different than the health/fitness blogs I’m used to, which is AWESOME! She earned bonus points in my book by being super quick to get the stuff in the mail. What is this you ask? Just a bag filled with individually wrapped biscotti! 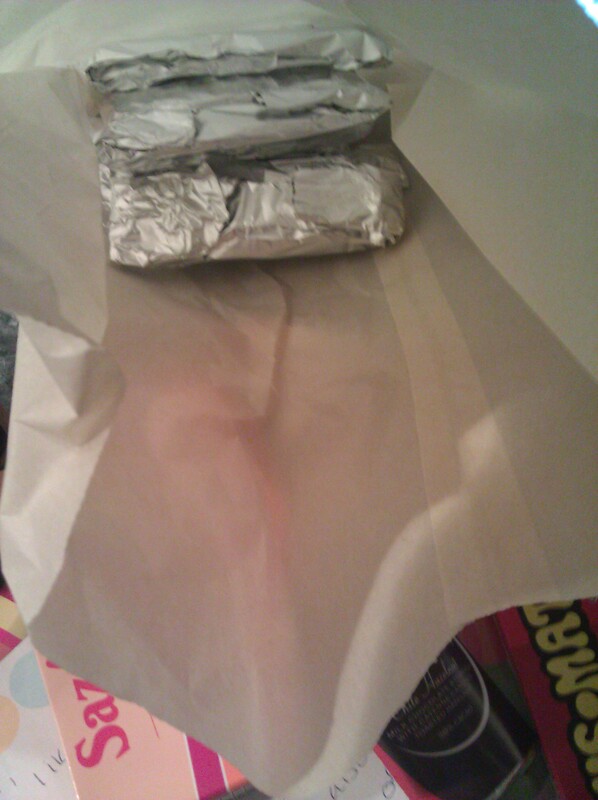 Paper bag/foil bundle – biscotti!! HOMEMADE! 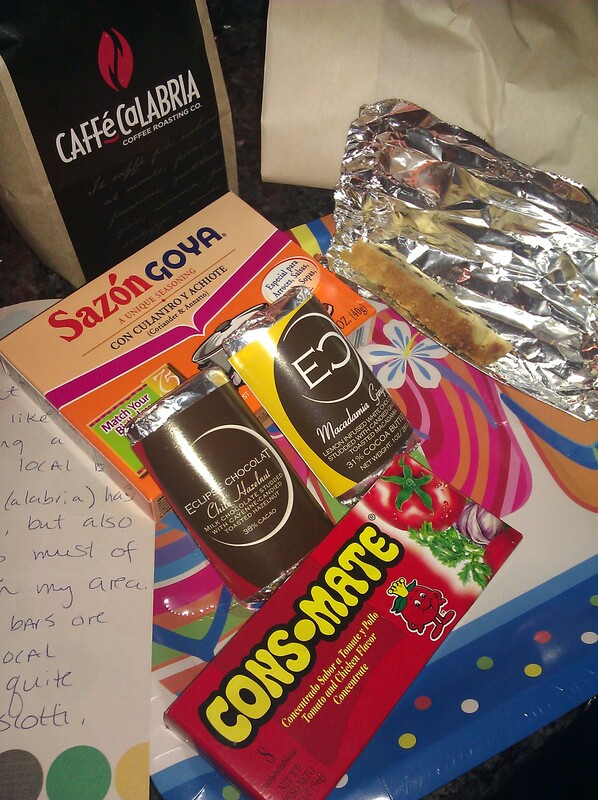 This was the first time my pen pal sent me a homemade baked good, so exciting…and so tasty. I’m trying to get Jenny to give me the recipe and I will gladly share it. They’re made with olive oil which I love. CONSoMATE – Haven’t used this yet, but I’m soooo intrigued. I believe it can be used in soups/sauces. Eclipse Chocolat in Chili hazelnut and Macadamia Ginger – I’ve only tried the Chili flavor so far and loved that it had some kick. Goya Sazon – DJ uses this ALL the time, so Jenny instantly got respect for sending an item so important to his kitchen. He was psyched to have more of it. To the left you can see the letter that Jenny wrote and underneath everything are some fun summer-themed paper plates that will come in very handy for future BBQs. It was a great box to receive and a big thanks for Jenny for bringing a smile to my face. Ha! Yes, with Groupon, the more the merrier. I love a good deal so I guess it really is no surprise that Groupon calls to me like this. Thing is, those $25 for $50 to a restaurant deals do nothing for me…I want at least 60% off! 🙂 Greedy. Now let me just say that Groupon Goods offers come one of two ways, with shipping included or with shipping extra. The leash and magnetic balls both had shipping included, the knives were an extra $5. The leash took almost a month to arrive, the balls took about a month and a half. The knives took maybe a week. Big difference for $5. The balls took so long that Groupon sent out an apology email and gave me a $5 credit. Appreciated. Anyone else on the Groupon bandwagon?? 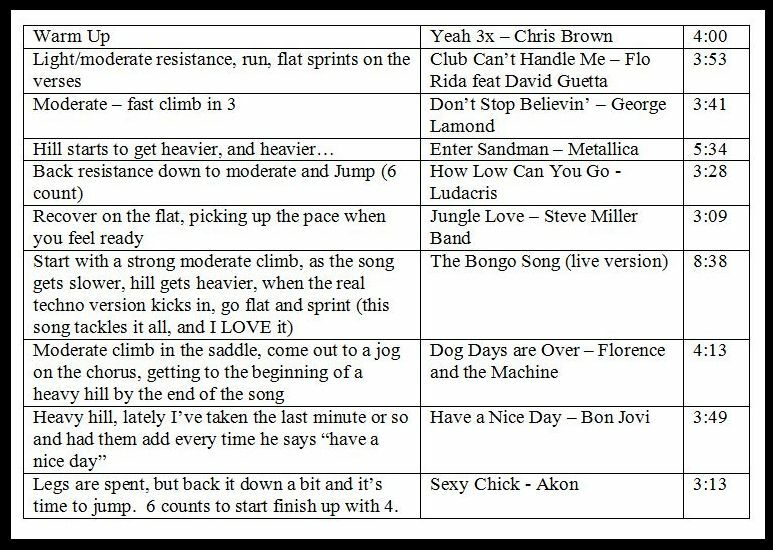 To any of my non-Spinners out there, feel free to use these playlists for any cardio/workout. It feels like it just might be one of those days where I have more than one cup of coffee. I’m going to wait a bit before committing to a second in hopes that the first is just slow to kick in. I guess that statement/sentiment kind of goes with the whole Monday morning thing. I still don’t understand why on a weekend I can wake up at 6:30a without an alarm yet during the week even with the alarm I have a hard time getting out of bed by 6:45. Why?? It’s not like I dread going to work, just don’t get it. How were the weekends? Mine ended up very different than expected. Going in to the weekend I had plans for Saturday night and Sunday day. Both ended up being cancelled due to sickness (their’s, not mine). So it ended up being an extremely low-key weekend, which was actually quite nice. Friday night I attempted to put together an Olympic themed ride for Saturday. 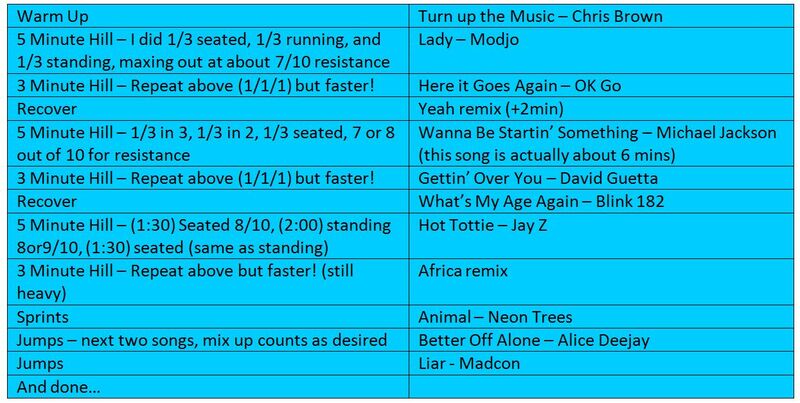 I downloaded a bunch of music from Chris’ playlist but ultimately just wasn’t feeling it, so I went with a standard ride. Class itself on Saturday was good, packed. Saturday was errands and then Saturday night DJ did a bunch of cooking just to use up some of the produce we had on hand. He cooked up a huge batch of sauce and meatballs and also made an eggplant pizza. Sunday I subbed a class and DJ played paintball. The class was good. It was full yet I still felt very little energy. I know I’ve said it a million times, but I just don’t get this particular gym. I’ll post the rides later, nothing new though. Unfortunately most of my Sunday was spent cleaning (my least favorite activity ever). 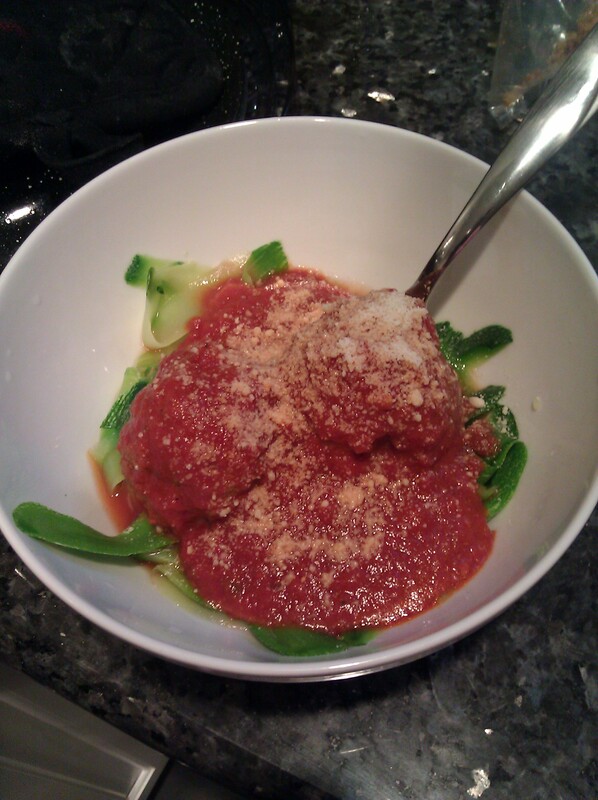 Of course the meatballs kind of negated the healthy-ness of this dish, but boy was it delicious! 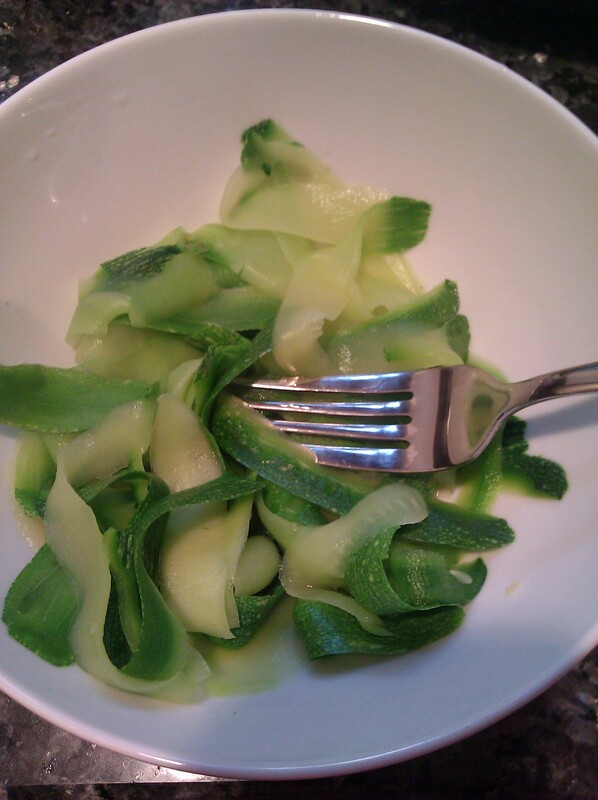 I without a doubt prefer the taste of zucchini over pasta, so I expect that this will show up many more times in the future. Prior to dinner, I had finished cleaning and wanted to bake. 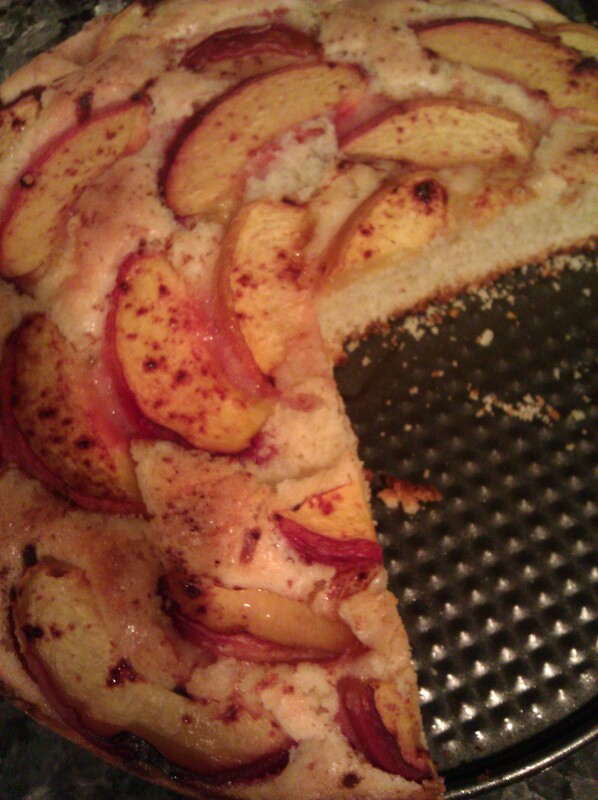 Last week I bought some hard peaches in anticipation of making my grandmother’s peach cake. Well, I didn’t have time until yesterday. Preheat oven to 350 degrees. Butter 9 inch diameter spring form pan. Whisk first 3 ingredients in small bowl to blend. Using electric mixer, beat butter in large bowl until fluffy. Beat in 3/4 cup sugar. Add eggs 1 at a time, then lemon juice and lemon peel, beating until blended after each addition. Beat in flour mixture. Spread batter in prepared pan. Press peach (plum) wedges halfway into batter in concentric circles, spacing slightly apart. Mix remaining 1-1/2 tablespoons sugar and cinnamon in small bowl; sprinkle over peaches (plums). Bake until cake is browned on top and tester inserted into center comes out clean, about 50 minutes. Cut around cake, release pan sides. Serve warm or at room temperature. Post baking comments…I used my Kitchenaid to mix everything (not a hand mixer). I also used spray to coat the pan, not butter. Unfortunately I overcooked mine as the top looked like it was still raw. Next time I’ll stick to the 50 minutes. Here we go Friday, here we go! I already know that this weekend is going to move too fast, but none the less, I’m still happy it’s Friday. There really is just something about knowing that I don’t have to go to work tomorrow. Woohoo! So judging by the fact that I am blogging, I did not get sucked up in to a tornado and end up in Oz. Phew. And while we did get a lot of rain, some thunder, and some lightning, I never lost power, and there were no fallen trees (near me). Essentially it ended up just being a thunderstorm. Phew. Prior to the storm I was out walking dogface. Somewhat suddenly it went from sunny and nice to cloudy and a bit windy. By that time we were almost home. We met up with a bunch of neighbors in the backyard and were all chatting about as it started to get darker, cooler, and windier. When the thunder’s frequency picked up, we all headed in. Just in time as moments later the sky opened up. While we were never in danger, I did attempt to use the storm as an excuse to not to some household chores. Lots of dishes were in the sink and I was on the phone with my mom. I said to her, “I should do dishes but feel like I probably shouldn’t during a storm, you know, I shouldn’t be in water”. To which she said, “I think you can do dishes”. I guess she was right. I started doing dishes when the TV said “there’s still lightning, so stay away from windows”. It just so happens that my sink is right near a window and a sliding glass door, uh oh. But I risked the threat to finish those darn dishes. Good news is, I lived to tell about it. 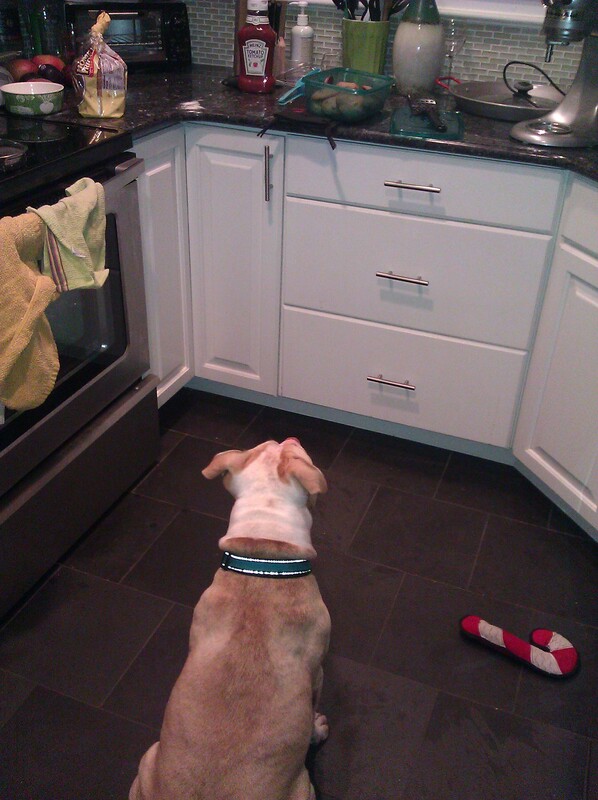 The cookies are in the green container on the counter, which clearly she knows. So what are your thoughts on the Olympics? I’m not overly into them but am sure I’ll end up watching some odds and ends. You may think I’m nuts, but I find that often times watching the Olympics makes me feel inadequate. My self-esteem is pretty stable, but watching these amazing athletes do things I would love to be able to do sometimes makes me feel like I’m a failure. Now I’m not saying that I truly feel like a failure, it’s just that instead of feeling awesome, I feel like maybe I could have done better growing up. OK, I’ll shut up on this since now I’m sure you think I’m nuts. I’m not, I promise. Have a great weekend and happy Olympics! We’re supposed to get some severe weather here tonight. Apparently usually we only get weather that is classified as moderate. Severe kind of scares me. The fact that they’re saying there’s a 5% chance of a funnel cloud freaks me the f out! So scared of tornadoes! Minnie and I will surely be hanging out hiding in the garage or the bathroom depending on how things look. Fingers very crossed that they are wrong…in a good way. Last night I subbed. I used this ride. I like this ride, so I had no issue with that. As promised though, the class was small and in my opinion, lacking in energy. Other instructors, if you teach both morning and evening classes, do you find that the morning ones have more energy? Two of my friends (who I met through spinning) made it to the class though, so that made me happy. A total of 9 people, not impressed. But overall it was fine, we worked, we sweated, and then we went home. At the same time as this class was a zumba class and a boot camp class. Definitely not an enviable time slot! I subbed out my class tonight (again, bad instructor). Why? Just because. (very bad instructor.) Oh well. Tomorrow’s Friday and I’m pretty darn excited about that…I’m just all set with work this week. Know the feeling? I’m happy to have made it to the halfway point of the workweek. It’s been a strange week here because about 60% of the office is at a sales meeting this week, so it’s QUIET. But they’re all back tomorrow and then I’m sure the organized chaos will resume. Since I had to stay pretty late at work on Monday I allowed myself to leave around 4:45 yesterday. Let me tell you, those extra 15 minutes felt so good! I got to the gym and felt like I had soooo much time! The gym got off to a slow start. Perhaps this is too “female” but when I’m dealing with PMS I find that it affects my energy and/or my strength. In addition, I’ve been suffering from some hip/knee pain (I blame heels for work). I knew I didn’t want to run or spin, so I hopped on the arc trainer for cardio, eeked out 10 minutes and then figured I’d do my pushups and try to mix in some jogging in place/jumping jacks. 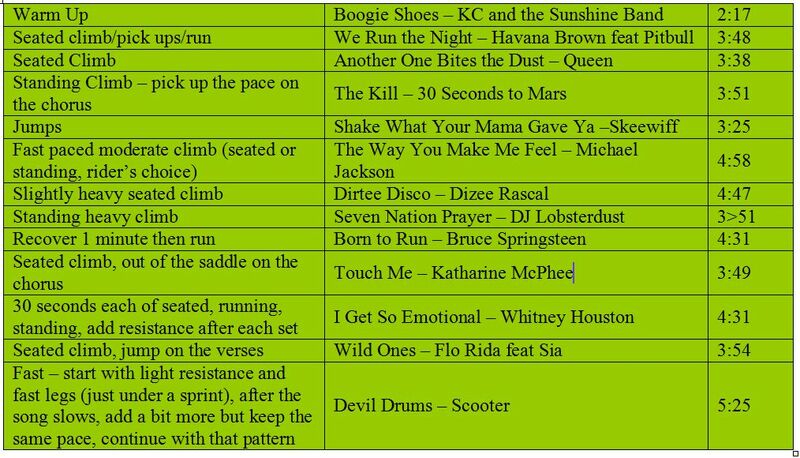 I took over the group exercise room, turned up the ipod and got to work. 5 sets of pushups. The first set was 9 and I struggled. How the heck was I going to get through the second set (11) not to mention the third, fourth, and fifth. But I dug deep, turned up the music and did manage to get through it. Total pushups yesterday…48. Did some core work (an area i’ve seriously been neglecting) and then did some additional arm work, putting the final nail in the coffin. By the time I was done, my arms were spent. Loved it! Got home to hang with dog-face and to cook some dinner. Usually DJ cooks but he had a softball game so I was in charge of cooking the swordfish. Our conversation earlier in the day was something like him asking me if I could cook it and me telling him I could Google how to cook it….which is what I did and it came out great! Success! In case you’re wondering, I just used some olive oil, adobo, salt, pepper, and a hint of cajun seasoning. I then put it on the grill (medium/high) for about 6-7 minutes on each side. Tonight I’m subbing at a gym I haven’t been to in ages. I used to teach there a lot so I’m kind of excited to go back. The instructor I’m subbing for told me the class is great, but small. I’m wondering what small is and hoping that this great weather doesn’t keep people away. Any fun Wednesday night plans out there? Have a great day!! Can anyone recommend a protein powder? I haven’t done the protein powder thing in quite sometime, but when I did, I was using Myofusion. I liked it because it tasted pretty good and had a relatively low calorie count. If you can recommend another brand which fits these parameters, please do. I’m starting to miss my smoothies. Can anyone recommend a food dehydrator? Yup, definitely not something I ever thought I’d be looking in to. I did a little online research but sometimes personal recommendations from people I know are more powerful (and helpful). Does anyone feel strongly about their dog food? (sorry, two dog posts in two days…oops). I know Minnie has heartburn but I’m thinking maybe her food is what’s causing it. Can’t help with either of these? Care to recommend anything? Just shoot me a comment with something you’d recommend. I’m game! Need a recommendation for something? Again, feel free to leave a comment and one of my gazillion readers just may have a suggestion. As promised (only slightly late), here is the revised Hill Repeats ride. I tried to go in to detail without overdoing it, but if you have questions, feel free to ask. Through one blog or another, I came to Eat Pray Tri who ingeniously decided to start-up a monthly post about her dog(s). You know I’m obsessed with my dog but I honestly do try to keep the dog-related posts to somewhat of a minimum. I don’t know that I’ll do a post every 23rd of the month but figured it couldn’t hurt to give it a try to see how it goes. Maybe by readership will hit an all time low, maybe it will hit a high, who knows. As you can probably tell from this photo, Minnie is an incredibly vicious and dangerous pitbull. I’m kidding about two of those things. 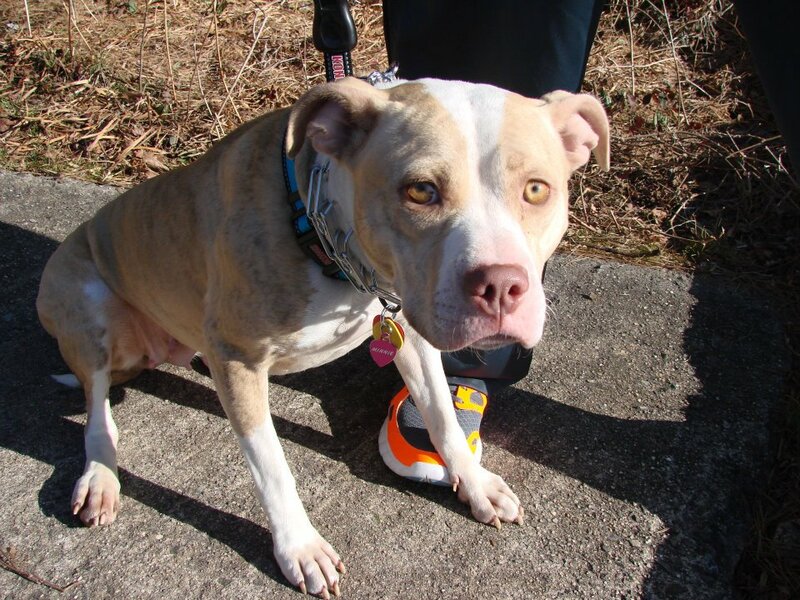 Yes, she is a pitbull, but she is the sweetest and often timid girl. It’s always interesting to see how people react when they ask what kind of dog I have and hear the word “pitbull”. I knew I wanted a dog for years and I knew I wanted to rescue, but that was about it. 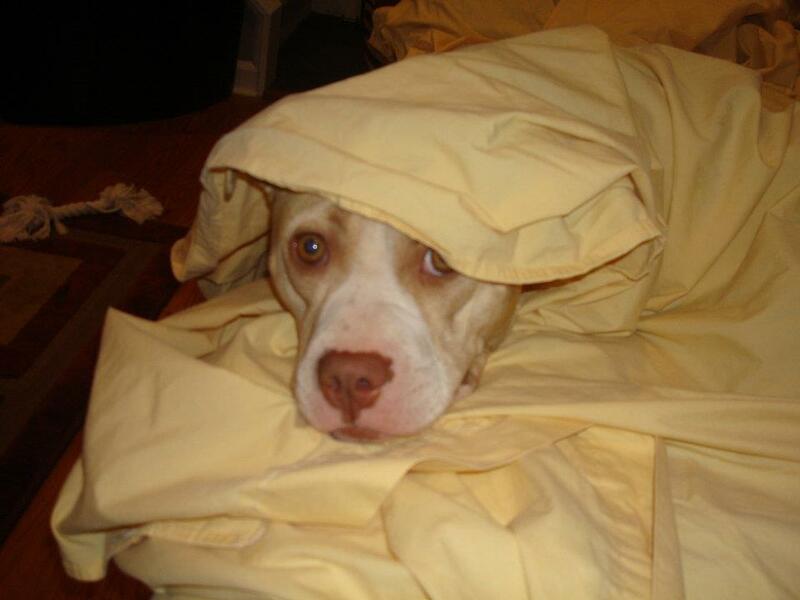 Where I live, the majority of dogs in shelters have at least some sort pitbull in them. In case you aren’t aware, Pitbull isn’t so much a breed as a grouping of breeds. 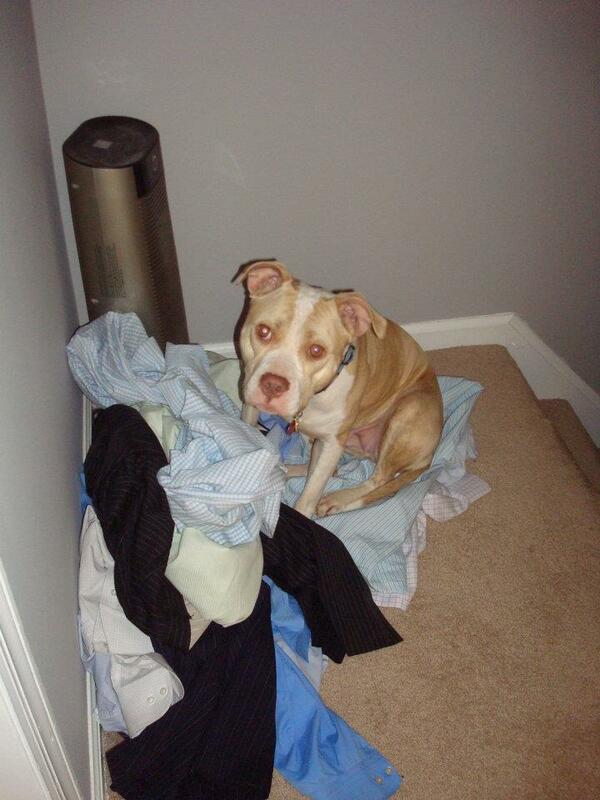 Anyway, my significant other had grown up with pits so he felt strongly that that was what he wanted. I was OK with it since a) it was a dog and b) it would definitely be a rescue. The process started when a dog was posted on Facebook (not Minnie) as urgent, meaning he needed to find a home in the next few days or else he was going to be put down. Often times this doesn’t mean the dog is problematic but that the shelter is overcrowded or the dog is showing signs of stress due to near 24 hour crating. Again, I digress. We met that dog and well let’s just say things didn’t work out. We were pretty upset with the process so we took a time out. A few weeks later I was introduced to Bully Breed Rescue, a local rescue group who pull dogs out of bad situations and foster them until a good home can be found. We met two dogs. Obviously Minnie was a better fit (the other dog ended up being adopted by his foster mom anyway). On February 4, 2012, Minnie came for a home-visit and stayed. She loves plush things…piles of anything. I will admit that the first few weeks were hard and I had many “what was I thinking” moments. Not because Minnie was a bad dog but just because I wasn’t used to the responsiblity and the invasion of my freedom. 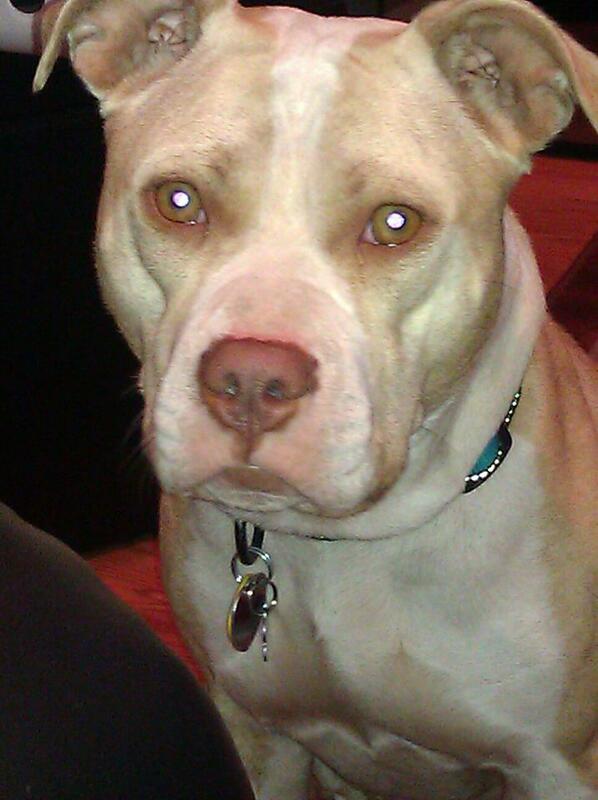 Now i can’t imagine our lives without her and she has even turned people who had a bad feeling about pitbulls around. I consider her my little ambassador. Without a doubt I will rescue another pit in the future.